Forget redemption, Virginia has achieved something far more precious. One year after suffering the most shocking loss in postseason history, the Cavaliers won the national championship Monday. Redemption was already assured with the Hoos’ trip to the Final Four, but here’s how Tony Bennett’s team went even further and won a national title and what that will mean for this program. Virginia erupted for 85 points in an eight-point victory over Texas Tech that, despite going to overtime, featured just 70 possessions. De’Andre Hunter scored 27 points thanks to four 3s and 7-of-9 shooting at the free throw line. Kyle Guy added 24 points, and Ty Jerome dished eight assists. The Hoos repeatedly held the ball until late in the shot clock and let Jerome create off the dribble. That turned out to be an excellent strategy: UVa recorded an outstanding 1.22 points per possession against one of the best NCAA tournament defenses of recent years. In the wake of the shattering UMBC loss a year ago, it was often asked whether the deliberate tempo Virginia uses to such great effect during the regular season might not somehow be a stylistic impediment when win-or-go-home basketball is the order of the day. That was a fair question when the Cavaliers were repeatedly underperforming their seed expectations. Naturally, it’s possible that some future Bennett team could suffer still another shocking tournament upset. Still, a direct pace-to-doom causation loop is looking iffier after the 2019 tournament. The Hoos actually slowed down relative to the regular season, averaging just 58 possessions per 40 minutes. One national championship doesn’t necessarily vindicate an entire style of basketball, but a better question might be how we choose which styles we think need vindication in the first place. With regular-season games that averaged around 60 possessions and a consistently balanced attack on offense, it was difficult for any single Virginia player to accumulate the kind of eye-catching per-game stats that earn the most notice. Nevertheless, Guy, Jerome and Hunter powered an offense that was just as good as if not better than the fabled Cavaliers defense in ACC play. All season long, the Hoos were able to generate a very high number of scoring chances (thanks to an exceedingly low turnover rate and pretty good offensive rebounding), and Bennett’s team used those opportunities to make a very high percentage of its 3s. 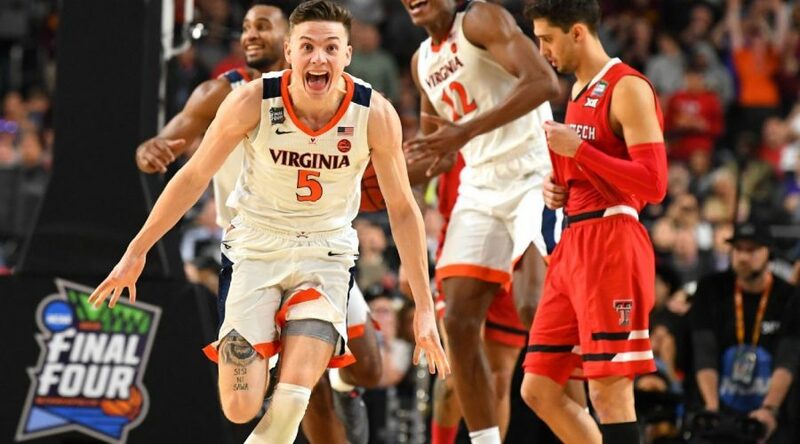 It’s a recipe for scoring points in abundance, and, while that didn’t happen in every game in the tournament, that’s precisely the approach that allowed Virginia to survive Purdue in the Elite Eight. Jerome and Guy combined for 49 points and nine made 3s against the Boilermakers, but it was Hunter who was just as indispensable in the national title game. The trio presented opponents with a true “pick your poison” matchup dilemma, and the result turned out to be a No. 1 seed and, eventually, a national title. The Red Raiders’ head coach has charted a meteoric and indeed historic rise at a basketball program that, before his arrival, had won a total of three NCAA tournament games since 2000. When that type of performance occurs in that type of setting, feverish speculation about said coach’s future is going to be a given. Take for example the current coaching carousel. UCLA, at this writing, has a vacancy, and, one might venture to say that, on paper, Beard certainly looks just as good if not better now than Steve Alford did in 2013 or than Ben Howland did in 2003. The broader point, however, is that even if the Bruins and Beard don’t get together, any coach who is hired for the job in Westwood is very likely to create a high-level vacancy somewhere. A very high-level vacancy somewhere will lead to speculation over whether Beard will take the job, every time and until further notice. Hunter is expected to enter the draft, where he’s being projected as a potential top-five pick. Additionally, Jerome is shown as a late first-round pick. Past Hunter and Jerome, however, no other Cavaliers are currently showing up in the top 60 on the ESPN 2019 mock draft board. That hardly guarantees that no UVa player not named either Hunter or Jerome will choose to leave early, of course, but, in a rotation where the lone senior is Jack Salt, it does appear that Bennett will have a solid nucleus returning for 2019-20. A core group made up of Guy, Kihei Clark, Mamadi Diakite and Braxton Key, for example, would be a force to be reckoned with in the ACC race. Throw in the fact that Virginia’s 85-19 in conference play the past six seasons, and there are some very strong long-term tendencies toward success in Charlottesville. It’s hardly out of the question that the Hoos could make their second consecutive Final Four in 2020.